This article is about Fabaceae s.l. (or Leguminosae), as defined by the APG System. For Fabaceae s.s. (or Papilionaceae), as defined by less modern systems, see Faboideae. Fabaceae distribution map. Legumes are found in four major biomes: tropical forest, temperate, grass, and succulent. The Fabaceae or Leguminosae, commonly known as the legume, pea, or bean family, are a large and economically important family of flowering plants. It includes trees, shrubs, and perennial or annual herbaceous plants, which are easily recognized by their fruit (legume) and their compound, stipulate leaves. Many legumes have characteristic flowers and fruits. The family is widely distributed, and is the third-largest land plant family in terms of number of species, behind only the Orchidaceae and Asteraceae, with about 751 genera and about 19,000 known species. The five largest of the genera are Astragalus (over 3,000 species), Acacia (over 1000 species), Indigofera (around 700 species), Crotalaria (around 700 species), and Mimosa (around 400 species), which constitute about a quarter of all legume species. The ca. 19,000 known legume species amount to about 7% of flowering plant species. Fabaceae is the most common family found in tropical rainforests and in dry forests in the Americas and Africa. Recent molecular and morphological evidence supports the fact that the Fabaceae is a single monophyletic family. This conclusion has been supported not only by the degree of interrelation shown by different groups within the family compared with that found among the Leguminosae and their closest relations, but also by all the recent phylogenetic studies based on DNA sequences. These studies confirm that the Fabaceae are a monophyletic group that is closely related to the Polygalaceae, Surianaceae and Quillajaceae families and that they belong to the order Fabales. Along with the cereals, some fruits and tropical roots, a number of Leguminosae have been a staple human food for millennia and their use is closely related to human evolution. The Fabaceae family includes a number of important agricultural and food plants, including Glycine max (soybean), Phaseolus (beans), Pisum sativum (pea), Cicer arietinum (chickpeas), Medicago sativa (alfalfa), Arachis hypogaea (peanut), Ceratonia siliqua (carob), and Glycyrrhiza glabra (liquorice). A number of species are also weedy pests in different parts of the world, including: Cytisus scoparius (broom), Robinia pseudoacacia (black locust), Ulex europaeus (gorse), Pueraria lobata (kudzu), and a number of Lupinus species. The Leguminosae have a wide variety of growth forms, including trees, shrubs, herbaceous plants, and even vines or lianas. The herbaceous plants can be annuals, biennials, or perennials, without basal or terminal leaf aggregations. Many Legumes have tendrils. They are upright plants, epiphytes, or vines. The latter support themselves by means of shoots that twist around a support or through cauline or foliar tendrils. Plants can be heliophytes, mesophytes, or xerophytes. "Pea flower" redirects here. For the flour produced from peas, see pea flour. In the Faboideae, the flowers are zygomorphic, and have a specialized structure. The upper petal, called the banner or standard, is large and envelops the rest of the petals in bud, often reflexing when the flower blooms. The two adjacent petals, the wings, surround the two bottom petals. The two bottom petals are fused together at the apex (remaining free at the base), forming a boat-like structure called the keel. The stamens are always ten in number, and their filaments can be fused in various configurations, often in a group of nine stamens plus one separate stamen. Various genes in the CYCLOIDEA (CYC)/DICHOTOMA (DICH) family are expressed in the upper (also called dorsal or adaxial) petal; in some species, such as Cadia, these genes are expressed throughout the flower, producing a radially symmetrical flower. The Leguminosae are rarely cyanogenic. Where they are, the cyanogenic compounds are derived from tyrosine, phenylalanine or leucine. They frequently contain alkaloids. Proanthocyanidins can be present either as cyanidin or delphinidine or both at the same time. Flavonoids such as kaempferol, quercitin and myricetin are often present. Ellagic acid has never been found in any of the genera or species analysed. Sugars are transported within the plants in the form of sucrose. C3 photosynthesis has been found in a wide variety of genera. The family has also evolved a unique chemistry. Many legumes contain toxic and indigestible substances which may be removed through various processing methods. Pterocarpans are a class of molecules (derivatives of isoflavonoids) found only in the Fabaceae. Forisome proteins are found in the sieve tubes of Fabaceae; uniquely they are not dependent on ADT. The order Fabales contains around 7.3% of eudicot species and the greatest part of this diversity is contained in just one of the four families that the order contains: Fabaceae. This clade also includes the Polygalaceae, Surianaceae and Quillajaceae families and its origins date back 94 to 89 million years, although it started its diversification 79 to 74 million years ago. In fact, the Fabaceae have diversified during the early tertiary to become a ubiquitous part of the modern earth’s biota, along with many other families belonging to the flowering plants. The Fabaceae have an abundant and diverse fossil record, especially for the Tertiary period. Fossils of flowers, fruit, leaves, wood and pollen from this period have been found in numerous locations. The earliest fossils that can be definitively assigned to the Fabaceae appeared in the late Palaeocene (approximately 56 million years ago). Representatives of the 3 sub-families traditionally recognised as being members of the Fabaceae – Cesalpinioideae, Papilionoideae and Mimosoideae — as well as members of the large clades within these sub-families – such as the genistoides – have been found in periods a little later, starting between 55 and 50 million years ago. In fact, a wide variety of taxa representing the main lineages in the Fabaceae have been found in the fossil record dating from the middle to the late Eocene, suggesting that the majority of the modern Fabaceae groups were already present and that a broad diversification occurred during this period. Therefore, the Fabaceae started their diversification approximately 60 million years ago and the most important clades separated 50 million years ago. The age of the main Cesalpinioideae clades have been estimated as between 56 and 34 million years and the basal group of the Mimosoideae as 44 ± 2.6 million years. The division between Mimosoideae and Faboideae is dated as occurring between 59 and 34 million years ago and the basal group of the Faboideae as 58.6 ± 0.2 million years ago. It has been possible to date the divergence of some of the groups within the Faboideae, even though diversification within each genus was relatively recent. For instance, Astragalus separated from the Oxytropis 16 to 12 million years ago. In addition, the separation of the aneuploid species of Neoastragalus started 4 million years ago. Inga, another genus of the Papilionoideae with approximately 350 species, seems to have diverged in the last 2 million years. The phylogeny of the legumes has been the object of many studies by research groups from around the world. These studies have used morphology, DNA data (the chloroplast intron trnL, the chloroplast genes rbcL and matK, or the ribosomal spacers ITS) and cladistic analysis in order to investigate the relationships between the family’s different lineages. Fabaceae is consistently recovered as monophyletic. The studies further confirmed that the traditional subfamilies Mimosoideae and Papilionoideae were each monophyletic but both were nested within the paraphyletic subfamily Caesalpinioideae. All the different approaches yielded similar results regarding the relationships between the family's main clades. Following extensive discussion in the legume phylogenetics community, the Legume Phylogeny Working Group reclassified Fabaceae into six subfamilies, which necessitated the segregation of four new subfamilies from Caesalpinioideae and merging Caesapinioideae sensu stricto with the former subfamily Mimosoideae. Cercidoideae: 12 genera and ~335 species. Mainly tropical. Bauhinia, Cercis. Detarioideae: 84 genera and ~760 species. Mainly tropical. Amherstia, Detarium, Tamarindus. Duparquetioideae: 1 genus and 1 species. West and Central Africa. Duparquetia. Dialioideae: 17 genera and ~85 species. Widespread throughout the tropics. Dialium. Caesalpinioideae: 148 genera and ~4400 species. Pantropical. Caesalpinia, Senna, Mimosa, Acacia. Includes the former subfamily Mimosoideae (80 genera and ~3200 species; mostly tropical and warm temperate Asia and America). Faboideae (Papilionoideae): 503 genera and ~14,000 species. Cosmopolitan. Astragalus, Lupinus, Pisum. Roots of Vicia with white root nodules visible. A large number of species within many genera of leguminous plants, e.g. Astragalus, Coronilla, Hippocrepis, Indigofera, Lotus, Securigera and Scorpiurus, produce chemicals that derive from the compound 3-nitropropanoic acid (3-NPA, beta-nitropropionic acid). The free acid 3-NPA is an irreversible inhibitor of mitochondrial respiration, and thus the compound inhibits the tricarboxylic acid cycle. This inhibition caused by 3-NPA is especially toxic to nerve cells and represents a very general toxic mechanism suggesting a profound ecological importance due to the big number of species producing this compound and its derivatives. A second and closely related class of secondary metabolites that occur in many species of leguminous plants is defined by isoxazolin-5-one derivatives. These compounds occur in particular together with 3-NPA and related derivatives at the same time in the same species, as found in Astragalus canadensis and Astragalus collinus. 3-NPA and isoxazlin-5-one derivatives also occur in many species of leaf beetles (see defense in insects). Legumes are economically and culturally important plants due to their extraordinary diversity and abundance, the wide variety of edible vegetables they represent and due to the variety of uses they can be put to: in horticulture and agriculture, as a food, for the compounds they contain that have medicinal uses and for the oil and fats they contain that have a variety of uses. The history of legumes is tied in closely with that of human civilization, appearing early in Asia, the Americas (the common bean, several varieties) and Europe (broad beans) by 6,000 BCE, where they became a staple, essential as a source of protein. Their ability to fix atmospheric nitrogen reduces fertilizer costs for farmers and gardeners who grow legumes, and means that legumes can be used in a crop rotation to replenish soil that has been depleted of nitrogen. Legume seeds and foliage have a comparatively higher protein content than non-legume materials, due to the additional nitrogen that legumes receive through the process. Legumes are commonly used as natural fertilizers. 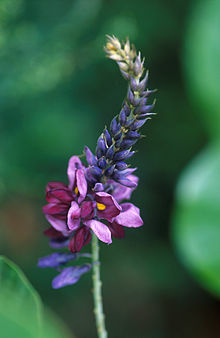 Some legume species perform hydraulic lift, which makes them ideal for intercropping. Farmed legumes can belong to numerous classes, including forage, grain, blooms, pharmaceutical/industrial, fallow/green manure and timber species, with most commercially farmed species filling two or more roles simultaneously. There are of two broad types of forage legumes. Some, like alfalfa, clover, vetch, and Arachis, are sown in pasture and grazed by livestock. Other forage legumes such as Leucaena or Albizia are woody shrub or tree species that are either broken down by livestock or regularly cut by humans to provide fodder. Grain legumes are cultivated for their seeds, and are also called pulses. The seeds are used for human and animal consumption or for the production of oils for industrial uses. Grain legumes include both herbaceous plants like beans, lentils, lupins, peas and peanuts. and trees such as carob, mesquite and tamarind. Bloom legume species include species such as lupin, which are farmed commercially for their blooms, and thus are popular in gardens worldwide. Laburnum, Robinia, Gleditsia, Acacia, Mimosa, and Delonix are ornamental trees and shrubs. Industrial farmed legumes include Indigofera, cultivated for the production of indigo, Acacia, for gum arabic, and Derris, for the insecticide action of rotenone, a compound it produces. Fallow or green manure legume species are cultivated to be tilled back into the soil to exploit the high nitrogen levels found in most legumes. Numerous legumes are farmed for this purpose, including Leucaena, Cyamopsis and Sesbania. Various legume species are farmed for timber production worldwide, including numerous Acacia species, Dalbergia species, and Castanospermum australe. Melliferous plants offer nectar to bees and other insects to encourage them to carry pollen from the flowers of one plant to others thereby ensuring pollination.A number of legume species are good nectar providers such as alfalfa, white clover, sweet clover and various Prosopis species. Many plants in the Fabaceae family are an important source of pollen for the bumblebee species Bombus hortorum. This bee species is especially fond of one species in particular; Trifolium pratense, also known as red clover, is a popular food source in the diet of Bombus hortorum. Natural gums are vegetable exudates that are released as the result of damage to the plant such as that resulting from the attack of an insect or a natural or artificial cut. These exudates contain heterogeneous polysaccharides formed of different sugars and usually containing uronic acids. They form viscous colloidal solutions. There are different species that produce gums. The most important of these species belong to the leguminosae. They are widely used in the pharmaceutical, cosmetic, food, and textile sectors. They also have interesting therapeutic properties; for example gum arabic is antitussive and anti-inflammatory. The most well known gums are tragacanth (Astragalus gummifer), gum arabic (Acacia senegal) and guar gum (Cyamopsis tetragonoloba). The species used to produce dyes include the following: Logwood Haematoxylon campechianum; a large spiny tree that can grow up to 15 m tall. Its cork is thin and soft and its wood is hard. The heartwood is used to produce dyes that are red and purple. The histological stain called haematoxylin is produced from this species. Brazilwood tree (Caesalpinia echinata) is similar to the previous tree but smaller and with red or purple flowers. The wood is also used to produce a red or purple dye. The Madras thorn (Pithecellobium dulce) is another spiny tree native to Latin America, it grows up to 4 m high and has yellow or green flowers that grow in florets. Its fruit is reddish and is used to produce a yellow dye. 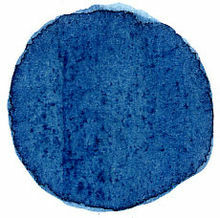 Indigo dye is extracted from the True indigo plant Indigofera tinctoria that is native to Asia. In Central and South America dyes are produced from two related species: indigo from Indigofera suffruticosa and Natal indigo from Indigofera arrecta. A yellow dye is extracted from Butea monosperma, commonly called as flame of the forest. The Cockspur Coral Tree Erythrina crista-galli is one of many leguminosae used as ornamental plants. In addition, it is the National Flower of Argentina and Uruguay. Legumes have been used as ornamental plants throughout the world for many centuries. Their vast diversity of heights, shapes, foliage and flower colour means that this family is commonly used in the design and planting of everything from small gardens to large parks. The following is a list of the main ornamental legume species, listed by sub-family. Subfamily Caesalpinioideae: Bauhinia forficata, Caesalpinia gilliesii, Caesalpinia spinosa, Ceratonia siliqua, Cercis siliquastrum, Gleditsia triacanthos, Gymnocladus dioica, Parkinsonia aculeata, Senna multiglandulosa. Subfamily Mimosoideae: Acacia caven, Acacia cultriformis, Acacia dealbata, Acacia karroo, Acacia longifolia, Acacia melanoxylon, Acacia paradoxa, Acacia retinodes, Acacia saligna, Acacia verticillata, Acacia visco, Albizzia julibrissin, Calliandra tweediei, Paraserianthes lophantha, Prosopis chilensis. Subfamily Faboideae: Clianthus puniceus, Citysus scoparius, Erythrina crista-galli, Erythrina falcata, Laburnum anagyroides, Lotus peliorhynchus, Lupinus arboreus, Lupinus polyphyllus, Otholobium glandulosum, Retama monosperma, Robinia hispida, Robinia luxurians, Robinia pseudoacacia, Sophora japonica, Sophora macnabiana, Sophora macrocarpa, Spartium junceum, Teline monspessulana, Tipuana tipu, Wisteria sinensis. The Cockspur Coral Tree (Erythrina crista-galli), is the National Flower of Argentina and Uruguay. The Elephant ear tree (Enterolobium cyclocarpum) is the national tree of Costa Rica, by Executive Order of 31 August 1959. The Brazilwood tree (Caesalpinia echinata) has been the national tree of Brazil since 1978. The Golden wattle Acacia pycnantha is Australia’s national flower. The Hong Kong Orchid tree Bauhinia blakeana is the national flower of Hong Kong. Trifolium repens in Kullu District of Himachal Pradesh, India. ^ a b Wojciechowski, M. F.; Lavin, M.; Sanderson, M. J. (2014). "A phylogeny of legumes (Leguminosae) based on analysis of the plastid matK gene resolves many well-supported sub clades within the family". American Journal of Botany. 91 (11): 1846–62. doi:10.3732/ajb.91.11.1846. PMID 21652332. ^ a b c d e Watson L.; Dallwitz, M. J. (2007-06-01). "The families of flowering plants: Leguminosae". Retrieved 9 February 2008. ^ a b c The Legume Phylogeny Working Group (LPWG). (2017). "A new subfamily classification of the Leguminosae based on a taxonomically comprehensive phylogeny". Taxon. 66 (1): 44–77. doi:10.12705/661.3. ^ a b Schrire, B. D.; Lewis, G. P.; Lavin, M. (2005). "Biogeography of the Leguminosae". In Lewis, G; Schrire, G.; Mackinder, B.; Lock, M. Legumes of the world. Kew, England: Royal Botanic Gardens. pp. 21–54. ISBN 978-1-900347-80-8. ^ a b International Code of Nomenclature for algae, fungi, and plants. Article 18.5 states: "The following names, of long usage, are treated as validly published: ....Leguminosae (nom. alt. : Fabaceae; type: Faba Mill. [= Vicia L.]); ... When the Papilionaceae are regarded as a family distinct from the remainder of the Leguminosae, the name Papilionaceae is conserved against Leguminosae." English pronunciations are as follows: /fəˈbeɪsi(i), -siaɪ, -sieɪ/, /ləˌɡjuːməˈnoʊsi/ and /pəˌpɪlioʊˈneɪsii/. ^ a b c d Judd, W. S., Campbell, C. S. Kellogg, E. A. Stevens, P.F. Donoghue, M. J. (2002), Plant systematics: a phylogenetic approach, Sinauer Axxoc, 287-292. ISBN 0-87893-403-0. ^ a b c d Stevens, P. F. "Fabaceae". Angiosperm Phylogeny Website. Version 7 May 2006. Retrieved 28 April 2008. ^ Burnham, R. J.; Johnson, K. R. (2004). "South American palaeobotany and the origins of neotropical rainforests". Philosophical Transactions of the Royal Society B: Biological Sciences. 359 (1450): 1595–1610. doi:10.1098/rstb.2004.1531. PMC 1693437. PMID 15519975. ^ a b Lewis G., Schrire B., Mackinder B. and Lock M. 2005. (eds.) Legumes of the world. The Royal Botanic Gardens, Kew, Reino Unido. 577 pages. 2005. ISBN 1-900347-80-6. ^ Doyle, J. J., J. A. Chappill, C.D. Bailey, & T. Kajita. 2000. Towards a comprehensive phylogeny of legumes: evidence from rbcL sequences and non-molecular data. pp. 1 -20 in Advances in legume systematics, part 9, (P. S. Herendeen and A. Bruneau, eds.). Royal Botanic Gardens, Kew, UK. ^ Kajita, T.; Ohashi, H.; Tateishi, Y.; Bailey, C. D.; Doyle, J. J. (2001). "rbcL and legume phylogeny, with particular reference to Phaseoleae, Millettieae, and allies". Systematic Botany. 26 (3): 515–536. JSTOR 3093979. ^ Angiosperm Phylogeny Group [APG] (2003). "An update of the Angiosperm Phylogeny Group classification for the orders and families of flowering plants: APG II" (PDF). Botanical Journal of the Linnean Society. 141 (4): 399–436. doi:10.1046/j.1095-8339.2003.t01-1-00158.x. ^ a b c Burkart, A. Leguminosas. In: Dimitri, M. 1987. Enciclopedia Argentina de Agricultura y Jardinería. Tomo I. Descripción de plantas cultivadas. Editorial ACME S.A.C.I., Buenos Aires. pages: 467-538. ^ Hélène L. Citerne; R. Toby Pennington; Quentin C. B. Cronk (8 August 2006). "An apparent reversal in floral symmetry in the legume Cadia is a homeotic transformation". PNAS. 103 (32): 12017–12020. doi:10.1073/pnas.0600986103. PMC 1567690. PMID 16880394. ^ a b c Herendeen, P. S., W. L. Crepet, and D. L. Dilcher. 1992. The fossil history of the Leguminosae: phylogenetic and biogeographic implications. Pages 303 – 316 in Advances in Legume Systematics, part 4, the fossil record (P. S. Herendeen and D .L. Dilcher, eds). Royal Botanic Gardens, Kew, UK. ^ Crepet, W. L.; Taylor, D. W. (1985). "The Diversification of the Leguminosae: First Fossil Evidence of the Mimosoideae and Papilionoideae". Science. 228 (4703): 1087–1089. doi:10.1126/science.228.4703.1087. ISSN 0036-8075. PMID 17737903. ^ Crepet, W. L., and P. S. Herendeen. 1992. Papilionoid flowers from the early Eocene of south eastern North America. Pages 43–55 in Advances in Legume Systematics, part 4, the fossil record (P. S. Herendeen and D. L. Dilcher, eds.). Royal Botanic Gardens, Kew, UK. ^ Herendeen, P. S. 1992. The fossil history of Leguminosae from the Eocene of south eastern North America. Pages 85-160 in Advances in Legume Systematics, part 4, the fossil record (Herendeen, P. S., and D. L. Dilcher, eds.). Royal Botanic Gardens, Kew, UK. ^ Herendeen, P. S. 2001. The fossil record of the Leguminosae: recent advances. In Legumes Down Under: the Fourth International Legume conference, Abstracts, 34–35. Australian National University, Canberra, Australia. ^ Herendeen, P. S., and S. Wing. 2001. Papilionoid legume fruits and leaves from the Palaeocene of north western Wyoming. Botany 2001 Abstracts, published by Botanical Society of America (http://www.botany2001.org/). ^ Wing, S. L., F. Herrera, and C. Jaramillo. 2004. A Palaeocene flora from the Cerrajón Formation, Guajíra Peninsula, north eastern Colombia. Pages 146-147 in VII International Organization of Paleobotany Conference Abstracts (21–26 March). Museo Egidio Feruglio, Trelew, Argentina. ^ Bruneau, A.; Mercure, M.; Lewis, G. P. & Herendeen, P. S. (2008). "Phylogenetic patterns and diversification in the caesalpinioid legumes". Canadian Journal of Botany. 86 (7): 697–718. doi:10.1139/B08-058. ^ Wikstrom, N.; Savolainen, V.; Chase, M. W. (2001). "Evolution of the angiosperms: calibrating the family tree". Proceedings of the Royal Society B: Biological Sciences. 268 (1482): 2211–2220. doi:10.1098/rspb.2001.1782. PMC 1088868. PMID 11674868. ^ Wojciechowski, M. F. 2003. Reconstructing the phylogeny of legumes (Leguminosae): An early 21st century perspective. Pp. 5-35, in Klitgaard, B. B. & Bruneau, A. (eds), Advances in Legume Systematics, Part 10, Higher Level Systematics. Royal Botanic Gardens, Kew. ^ Wojciechowski, M. F. (2005). "Astragalus (Fabaceae): A molecular phylogenetic perspective". Brittonia. 57 (4): 382–396. doi:10.1663/0007-196X(2005)057[0382:AFAMPP]2.0.CO;2. JSTOR 4098954. ^ Wojciechowski, M. F.; Sanderson, M. J.; Baldwin, B. G.; Donoghue, M. J. (1993). "Monophyly of aneuploid Astragalus: Evidence from nuclear ribosomal DNA internal transcribed spacer sequences". American Journal of Botany. 80 (6): 711–722. doi:10.2307/2445441. JSTOR 2445441. ^ Schrire, B. D.; Lavin, M.; Lewis, G. P. (2005). "Global distribution patterns of the Leguminosae: insights from recent phylogenies". In Friis, I; Balslev, H. Plant diversity and complexity patterns: local, regional and global dimensions. Biologiske Skrifter. 55. Viborg, Denmark: Special-Trykkeriet Viborg A/S. pp. 375–422. ISBN 978-87-7304-304-2. ^ Pan, Aaron D.; Jacobs, Bonnie F.; Herendeen, Patrick S. (2010). "Detarieae sensu lato (Fabaceae) from the Late Oligocene (27.23 Ma) Guang River flora of north-western Ethiopia". Botanical Journal of the Linnean Society. 163: 44–54. doi:10.1111/j.1095-8339.2010.01044.x. ^ Doyle, J. J.; Luckow, MA (2003). "The Rest of the Iceberg. Legume Diversity and Evolution in a Phylogenetic Context". Plant Physiology. 131 (3): 900–10. doi:10.1104/pp.102.018150. PMC 1540290. PMID 12644643. ^ Yokota, Keisuke; Hayashi, Makoto (2011). "Function and evolution of nodulation genes in legumes". Cellular and Molecular Life Sciences. 68 (8): 1341–51. doi:10.1007/s00018-011-0651-4. PMID 21380559. ^ Markmann, Katharina; Giczey, Gábor; Parniske, Martin (2008). "Functional Adaptation of a Plant Receptor- Kinase Paved the Way for the Evolution of Intracellular Root Symbioses with Bacteria". PLoS Biology. 6 (3): e68. doi:10.1371/journal.pbio.0060068. PMC 2270324. PMID 18318603. ^ Rodríguez-Llorente, Ignacio D.; Pérez-Hormaeche, Javier; Mounadi, Kaoutar El; Dary, Mohammed; Caviedes, Miguel A.; Cosson, Viviane; Kondorosi, Adam; Ratet, Pascal; Palomares, Antonio J. (2004). "From pollen tubes to infection threads: Recruitment of Medicago floral pectic genes for symbiosis". The Plant Journal. 39 (4): 587–98. doi:10.1111/j.1365-313X.2004.02155.x. PMID 15272876. ^ Downie, J. Allan (2005). "Legume Haemoglobins: Symbiotic Nitrogen Fixation Needs Bloody Nodules". Current Biology. 15 (6): R196–8. doi:10.1016/j.cub.2005.03.007. PMID 15797009. ^ a b Martin F. Wojciechowski; Johanna Mahn; Bruce Jones (2006). "Fabaceae". The Tree of Life Web Project. ^ Käss E, Wink M (1996). "Molecular evolution of the Leguminosae: phylogeny of the three subfamilies based on rbcL sequences". Biochemical Systematics and Ecology. 24 (5): 365–378. doi:10.1016/0305-1978(96)00032-4. ^ Käss E, Wink M (1997). "Phylogenetic relationships in the Papilionoideae (Family Leguminosae) based on nucleotide sequences of cpDNA (rbcL) and ncDNA (ITS1 and 2)". Mol. Phylogenet. Evol. 8 (1): 65–88. doi:10.1006/mpev.1997.0410. PMID 9242596. ^ Doyle JJ, Doyle JL, Ballenger JA, Dickson EE, Kajita T, Ohashi H (1997). "A phylogeny of the chloroplast gene rbcL in the Leguminosae: taxonomic correlations and insights into the evolution of nodulation". Am. J. Bot. 84 (4): 541–554. doi:10.2307/2446030. JSTOR 2446030. PMID 21708606. ^ Lavin M, Doyle JJ, Palmer JD (1990). "Evolutionary significance of the loss of the chloroplast-DNA inverted repeat in the Leguminosae subfamily Papilionoideae". Evolution. 44 (2): 390–402. doi:10.2307/2409416. JSTOR 2409416. ^ Sanderson MJ, Wojciechowski MF (1996). "Diversification rates in a temperate legume clade: are there "so many species" of Astragalus (Fabaceae)?". Am. J. Bot. 83 (11): 1488–1502. doi:10.2307/2446103. JSTOR 2446103. ^ Chappill JA. (1995). "Cladistic analysis of the Leguminosae: the development of an explicit hypothesis". In Crisp MD, Doyle JJ. Advances in Legume Systematics, Part 7: Phylogeny. Royal Botanic Gardens, Kew, UK. pp. 1–10. ISBN 9780947643799. ^ Bruneau A, Mercure M, Lewis GP, Herendeen PS (2008). "Phylogenetic patterns and diversification in the caesalpinioid legumes". Botany. 86 (7): 697–718. doi:10.1139/B08-058. ^ Cardoso D, Pennington RT, de Queiroz LP, Boatwright JS, Van Wykd BE, Wojciechowskie MF, Lavin M (2013). "Reconstructing the deep-branching relationships of the papilionoid legumes". S. Afr. J. Bot. 89: 58–75. doi:10.1016/j.sajb.2013.05.001. ^ Lloret, L.; Martínez-Romero, E. (2005). "Evolución y filogenia de". Rhizobium. 47 (1–2): 43–60. Archived from the original on 2013-04-11. ^ a b c Sprent, J. I. 2001. Nodulation in legumes. Royal Botanic Gardens, Kew, UK. ^ Becker T.; et al. (2017). "A tale of four kingdoms - isoxazolin-5-one- and 3-nitropropanoic acid-derived natural products". Natural Product Reports. 34 (4): 343–360. doi:10.1039/C6NP00122J. PMID 28271107. ^ Allen, O. N., & E. K. Allen. 1981. The Leguminosae, A Source Book of Characteristics, Uses, and Nodulation. The University of Wisconsin Press, Madison, USA. ^ Duke, J. A. 1992. Handbook of Legumes of Economic Importance. Plenum Press, New York, USA. ^ Graham, P. H.; Vance, C. P. (2003). "Legumes: importance and constraints to greater use". Plant Physiology. 131 (3): 872–877. doi:10.1104/pp.017004. PMC 1540286. PMID 12644639. ^ Wojciechowski, M.F. 2006. Agriculturally & Economically Important Legumes.. Accessed 15 November 2008. ^ Sprent, Janet I. (2009). Legume Nodulation: A Global Perspective. Ames, Iowa: Wiley-Blackwell. p. 12. ISBN 978-1-4051-8175-4. Preview available at Google Books. ^ Goulson, J.; Kaden, J.C.; Lepais, G.C. (2011). "Population Structure, Dispersal and Colonization History of the Garden Bumblebee Bombus Hortorum in the Western Isles of Scotland". Conservation Genetics. 12 (4): 867–879. doi:10.1007/s10592-011-0190-4. ^ Marquez, A. C., Lara, O.F., Esquivel, R. B. & Mata, E. R. 1999. Composición, usos y actividad biológica: Plantas medicinales de México II. UNAM. First edition. México, D.F. ^ a b c Macaya J. 1999. Leguminosas arbóreas y arbustivas cultivadas en Chile. Chloris Chilensis Año 2. Nº1. ^ Ministerio de Educación de la Nación. Subsecretaría de Coordinación Administrativa. Día de la Flor Nacional "El Ceibo". Efemérides Culturales Argentinas. Consulted 3 March 2010. ^ Gilbert Vargas Ulate. 1997. Geografía turística de Costa Rica. EUNED, 180 p. ISBN 9977-64-900-6, 9789977649009. ^ "Lei Nº 6.607, de 7 de dezembro de 1978. O Presidente da República, faço saber que o Congresso Nacional decreta e eu sanciono a seguinte Lei: Art. 1º- É declarada Árvore Nacional a leguminosa denominada Pau-Brasil (Caesalpinia echinata, Lam), cuja festa será comemorada, anualmente, quando o Ministério da Educação e Cultura promoverá campanha elucidativa sobre a relevância daquela espécie vegetal na História do Brasil." ^ Boden, Anne (1985). "Golden Wattle: Floral Emblem of Australia" (http). Australian National Botanic Gardens. Retrieved 8 October 2008. ^ Williams, Martin (1999). "Golden Enigmatic Beauty" (http). Bahuninia. Retrieved 8 October 2008. Wikisource has the text of the 1920 Encyclopedia Americana article Leguminosæ. Asociación Española de las Leguminosas (AEL). Charity founded to promote the agricultural use of legumes in Spain. This page was last edited on 1 April 2019, at 10:55 (UTC).